Elvis performing with a number of dancers he doesn’t know are actually demons. In times of great need or extreme stress, pretty much everyone’s survival instinct kicks in and we all default to certain coping mechanisms that have gotten us through our entire lives. For some people, that means cooking. For others, it means performing. Regardless of what your specific method of dealing with the world is, you’ll likely have something in common with at least a few of the heroes of this week’s best comics—because honestly, they’re all just trying to make it through the week, same as any other person. Their worlds may be falling apart, but all they can do is keep on keeping on, hoping that things’ll work out so long as they fight hard enough. Xoo, an unlicensed chef, and her dog, Buster. Imagine a world where food culture was an inexorable part of literally every single aspect of a society’s economy—a world where going into the highly-competitive restaurant business was pretty much your only chance at success in life. In Image’s Flavor, a teenaged girl named Xoo dreams of nothing more than crafting bespoke meals at the small food joint where she grew up watching her parents cook, before a tragic accident made it impossible for them to leave their home. Left largely to her own devices, Xoo becomes something of a latchkey kid on a journey toward fulfilling her dreams. Rather than going to school and getting her government-mandated chef’s license, she operates in secret, spending much of her time competing with other chefs as they frantically fight to secure rare, valuable ingredients. There’s a case in every FBI agent’s past that affected them so deeply, it made them seriously consider finding another line of work. It’s not often agents actually speak about the cases because, obviously, they’re not at liberty to do so—but sometimes, there’s more to it than just that. Aftershock Comics’ A Walk Through Hell tells the story of Agents Shaw and McGregor, two partners who, unbeknownst to them, are at the very beginning of one of those life-changing cases. As is often the case, things start off simply enough. When two of their fellow agents mysteriously vanish while investigating a strange warehouse, local police are deployed to search for them, but something in the warehouse immediately sends the police into an eery, despondent silence that the agents don’t understand. Something in the warehouse got to the police before Shaw and McGregor could and as much as they might not want to admit it to themselves, they aren’t at all prepared to handle it, either. Elvis Presley discussing the state of his dead mother’s soul. 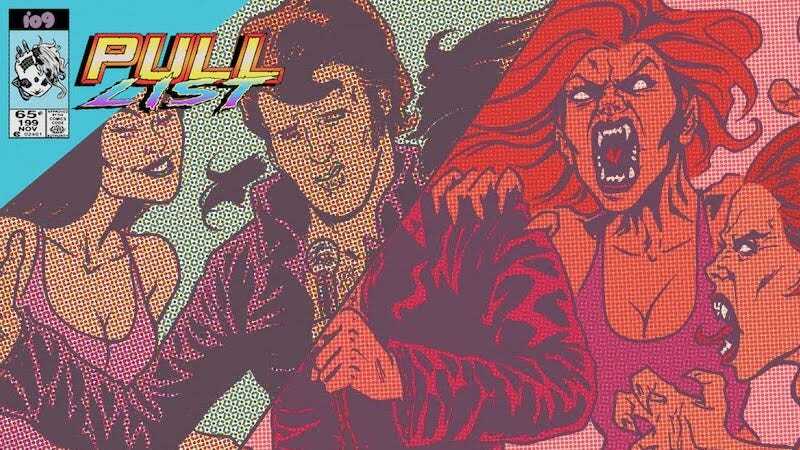 Bubba Ho-Tep and the Cosmic Blood-Suckers is a comic for anyone who ever wished that The League of Extraordinary Gentleman was about Elvis Presley teaming up with the descendant of John Henry and a bunch of psychics to prevent the apocalypse. Writer Joshua Jabcuga imagines a world where the charisma of legendary performers like Elvis doesn’t just make them pop stars, it imbues them with a unique energy that draws the attention of paranormal beings. At the behest of President Nixon, Elvis is conscripted into a team of other extraordinary people as they set out to investigate a series of strange happenings occurring down in Louisiana.